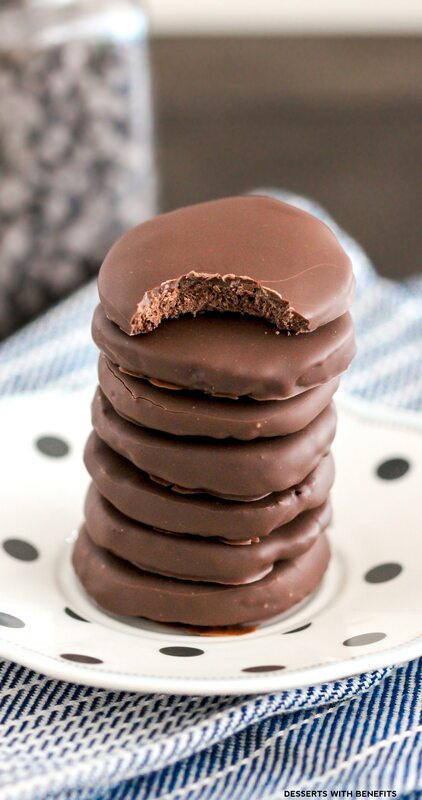 Healthy Skinny Minties (aka Homemade Thin Mints)! They’re crunchy, they’re sweet, they’re chocolatey, and they’re minty fresh. You’d never know they’re made without the refined flour, trans fats, and white sugar. Making a healthy, homemade version of these classic Girl Scout cookies has been on my Baking To-Do list for years. Yes, years. I put it off because I was intimidated. What if the cookies weren’t crunchy enough? What if the coating wasn’t minty enough? How would they compare to the originals? But seriously, Jessica? It’s a damn cookie! Chillllaaaax. Anyways, I finally made this recipe because my best friend eats Thin Mints like they’re a major food group. My fear of making homemade Thin Mints that weren’t exactly like the originals was ridiculous. Who cares if they’re the same, as long as they taste good, right? With your first bite, these Healthy Skinny Minties are crunchy. You instantly get the hit of mint, then the rich chocolate, and the perfect, non-overpowering sweetness. They’re not exactly like the Girl Scouts version, but they’re still amazing. So amazing that I ate five (or six…) during the food photography session alone. I mean, why not? They don’t have the dangerous hydrogenated oils, unhealthy white sugar and bad-for-you bleached flour like the Girl Scouts version. 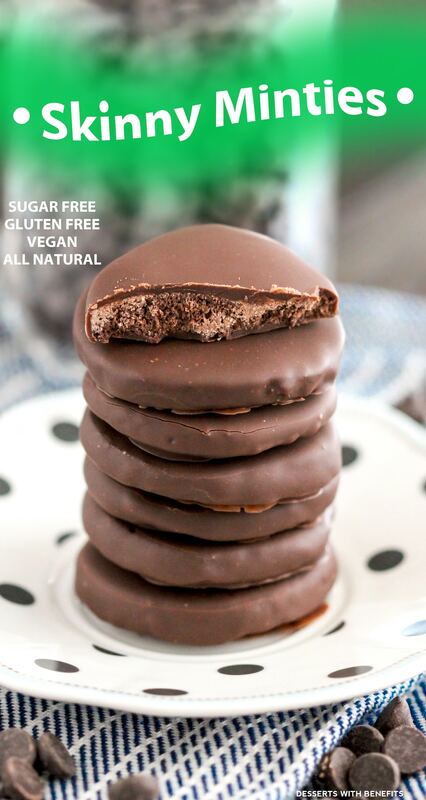 These Healthy Homemade Thin Mints are better for you than those pre-packaged Girl Scouts cookies, yet they taste JUST like the original! In a small bowl, whisk together the oat flour, erythritol, cocoa powder, baking powder and salt. In a large microwave-safe bowl, add the almond milk, coconut oil and vanilla extract. Microwave at 15-second intervals, stirring between each one, until the coconut oil is melted. Dump the dry ingredients into the wet ingredients and stir together until fully mixed. Dump the dough onto some plastic wrap. 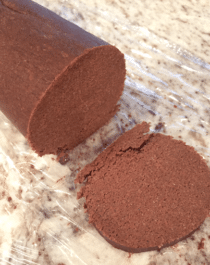 Pat the dough into a ball, then form into a log shape. 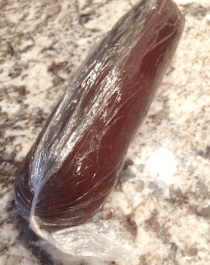 Wrap the dough with the plastic wrap, then form into a smooth log. Refrigerate the dough for 1-1½ hours. With a sharp knife, slice the log into cookies. The dough is slightly delicate, so the bottoms of some slices may crumble off. It's really easy to just stick it back on though! Put the cookie dough rounds onto the prepared cookie sheet and bake for 11 minutes. The cookies will be sponge-like right now, but don't worry, they firm up as they cool! When the cookies are completely cool, add the dark chocolate and cacao butter to a small microwave-safe bowl. Microwave at 30-second intervals, stirring between each one, until melted. Stir in the peppermint flavor. Dip the cookies into the melted chocolate, tap off the excess, then place back on the cookie sheet. 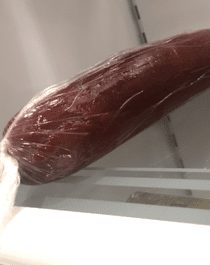 Refrigerate until completely firm. Serve and enjoy! Keeps for ~5 days. 1st ingredient: refined white flour. 2nd ingredient: bleached white sugar. 3rd ingredient: hydrogenated oils (aka dangerous trans fats). These look like a dream! Thin mints were always my favorite (especially when they came out of the freezer), but I can’t even tell you how many years it has been since I’ve had them! Making this ASAP! Okay, that’s it, you’ve convinced me I DEFINITELY need to come to the restaurant where you work now. Oatmeal creme pies?! I used to LOVE those Little Debbie treats as a kid! Hahaha, and yes indeed, it’s just a damn cookie. You crack me up. Oooh! If you opened a bakery, I would certainly visit ALL the time. Dream big, girl! Hi Vicki! Erythritol is a natural sweetener — it looks and tastes just like sugar, but without the calories, carbohydrates and sugar. You can certainly replace this with another granulated sweetener, like evaporated cane juice or sucanat. I wouldn’t recommend using regular white sugar though. Will be trying them this holiday! Thanks Jessica! Oh gosh I was the same way but with Samoas instead of Thin Mints. Those cookies literally disappear before peoples’ eyes, they’re just TOO sugary/addicting. 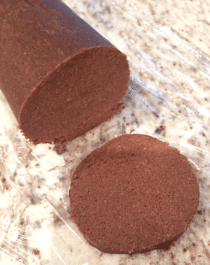 Vegan thin mints! These look amazing! Hello! These looks fantastic! By the way, did you know you can dip Ritz crackers in Andes thin mints and they taste exactly like Girl Scout cookies? I don’t know if this is vegan or not as I never checked out the ingredients for Andes mints and the Ritz crackers. I have fooled everyone with these cookies! I have to try these I’m paleo, are these dairy free? when i went to cut the cookies they kept crumbling and not staying into a cookie shape, i followed the recipe exactly and ive done this a few times. Looks like a great recipe! Where do you purchase your peppermint flavor? Is it an extract or essential food grade oil? Thank you! Oh emm gee Jessica your cursive on the ziplock bag…. soooooo beautifully written!! I wish I could write half as nice as that. I’m an ardent follower of your recipes but only today I thought of googling for GS thin mints and of course I was hoping you have them on your site. I just skimmed through the post, haven’t really digested it yet but I had to say something about that nice handwriting first haha..
I’m glad you like my recipes! 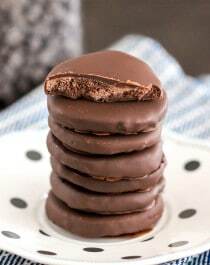 I hope you get a chance to make these thin mints, they’re suuuuuper yummy! Are these larger than regular Thin Mints? I love that they are GF, vegan, etc. but nutritionally 3 of them are the same number of calories, with more fat, than 4 regular thin mints. The lack of sugar is great, but curious if the cookies end up bigger and that’s the reason for the serving size? I would think the lack of sugar would bring the calories down.